WWE #24 review: The lowest blow with the best of intentions – AiPT! In 2018, AJ Styles was in the middle of what would become a near year-long run as WWE Champion. Beginning with winning the title just before Survivor Series 2017, Styles would be a fighting champion, taking on all comers. WWE #24 continues the story of Styles as champion, chronicling his intense rivalry with Japanese megastar, Shinsuke Nakamura. Once again, BOOM! Studios’ WWE has proven itself to be more in-depth and concerned with kayfabe storyline than the actual television product. While Styles has been the protagonist of the last several issues of WWE (and will continue to be so as his title reign lasted through November 2018), this issue spent more time on his new antagonist, Nakamura. Styles and Nakamura wrestled in a near-perfect match while both were working in New Japan Pro Wrestling, and the inevitable encounter between the two was, rightfully, billed as a WWE dream match. With Nakamura winning the Royal Rumble, he earned a shot at Styles’ title on the “Grandest Stage of the All,” WrestleMania. As is clearly laid out by writer Dennis Hopeless, both Nakamura and Styles were faces — good guys in wrestling parlance — leading into Mania. This all ended post-match when the loser, Nakamura, hit a vicious low blow on Styles, laying him out in front of 70,000 fans. Nakamura continued to attack Styles in this dastardly fashion through multiple encounters and matches throughout the summer. As always, Hopeless feeds readers enough of the factual moments with a healthy dose of backstage, kayfabe scripting that is so valuable to understanding the ins and outs of the character interactions. In WWE #24, Nakamura croaks out a strained “You’re welcome” to Styles, driving him more and more crazy as the attacks a feud continue. Shinsuke manipulates AJ through every match, goading him into untoward actions of his own. In the end, Nakamura explains his actions to Styles, giving him a very WWE line about how people never remember wins and losses, but instead remember the rivalries that last. By upsetting AJ, Shinsuke was guaranteeing rematches, cementing their feud in the memories of the WWE Universe, thus explaining the “You’re welcomes” in a succinct way that the weekly TV shows just cannot seem to do. Artist Serg Acuña has really stepped up his game in this issue, solidifying his vision of Styles along with an excellent portrayal of the oddly flexible Nakamura. 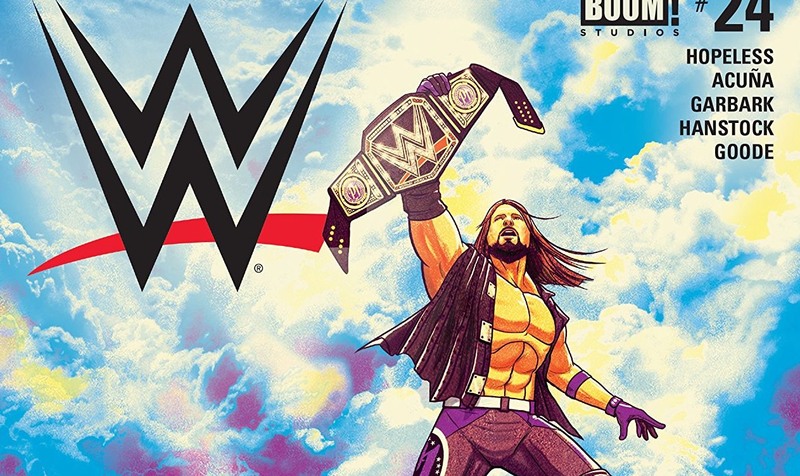 With a consistent protagonist and a deep story to tell, WWE has come into its own, balancing the kayfabe comic book storyline with enough actual events to give even jaded wrestling fans something to get excited about. Comic-book Nakamura claims that his extension of the rivalry created something fans would watch again and again. The King of Strong Style is right. I’m going to flip on the WWE Network and watch that Mania match again. With a consistent protagonist and a deep story to tell, BOOM! Studios' 'WWE' has come into its own, balancing the kayfabe comic book storyline with enough actual events to give even jaded wrestling fans something to get excited about. I still think Nakamura should have won the title at WrestleMania.